This fact sheet provides information on meningitis. Our fact sheets are designed as general introductions to each subject and are intended to be concise. Sources of further support and more detailed information are listed in the Useful Contacts section. There are different types of meningitis and each person is affected differently. You should speak with your doctor or specialist for individual advice. Please note that this fact sheet focuses on meningitis in adults. You should contact one of the organisations in the Useful Contacts section for information on meningitis in children. Meningitis is inflammation of the protective membranes that surround the brain and spinal cord, known as the meninges. Meningitis can be caused by viral, bacterial and fungal infections, as well as by reactions to certain drugs and by chemical irritation of the membranes. You might also experience feeling sick (nausea), being sick (vomiting), diarrhoea, and other symptoms such as a sore throat. If you have a mild case of viral meningitis you might only experience these flu-like symptoms before beginning to recover. A commonly known test for meningitis and septicaemia, involves pressing a glass tumbler (a drinking glass) on a person’s rash to see if it disappears under the pressure or not. If the rash doesn’t fade or disappear then this is thought to be a sign of meningitis. Although this test is sometimes recommended by health professionals and organisations, if you are worried about someone who is ill and you suspect they may have meningitis, do not wait for a rash to appear before you seek medical advice. Suspected meningitis is a medical emergency. If you suspect anyone of having meningitis call 999 for an ambulance immediately. Meningitis can be a life threatening condition and the symptoms can develop very quickly. The sooner someone receives treatment, the better their chance of making a good recovery. Meningitis is usually the result of an infection caused by bacteria or a virus. 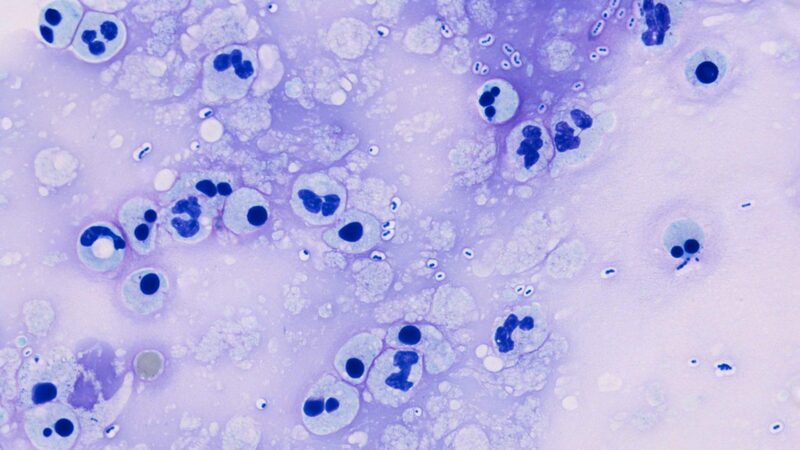 There are other possible causes, such as infection by a fungus, but they are very rare. Viral meningitis, also known as viral meningo-encephalitis, is the most common form of meningitis. Cases of viral meningitis are usually less serious and symptoms can be so mild that they are mistaken for flu. This makes the number of cases hard to estimate. This form of meningitis is most prevalent in children, though it can affect a person of any age, and it is more widespread during the summer and autumn. The bacteria that cause meningococcal and pneumococcal meningitis can be spread via close contact with other people and there is a risk of outbreaks of bacterial meningitis in places where large groups of people live together (for example, colleges or universities). Chemical meningitis is another rare form of meningitis. The inflammation of the meninges in these cases is the result of irritation by chemicals and usually occurs after surgery or other invasive treatments and procedures on the brain or spine. Meningitis has also been known to occur as a reaction to drugs, including some types of antibiotics, anaesthetics, and chemotherapy drugs. There are no reliable ways to easily distinguish between the different types of meningitis when the symptoms first start, so if you suspect that you or someone else has meningitis then you should always seek immediate medical advice. If meningitis is suspected, several tests may be performed to confirm the diagnosis and to check what is causing it. It is not uncommon for treatment with antibiotics to begin before any test and investigations have been performed, in case a person has bacterial meningitis. If the results come back to say that it is not bacterial then the course of antibiotics can be stopped, and more appropriate treatment given. Blood tests are performed to check for the presence of bacteria or viruses. The results of a blood test can help to determine what is causing the inflammation of the membranes around the brain and spine, and help to inform what treatment is necessary. 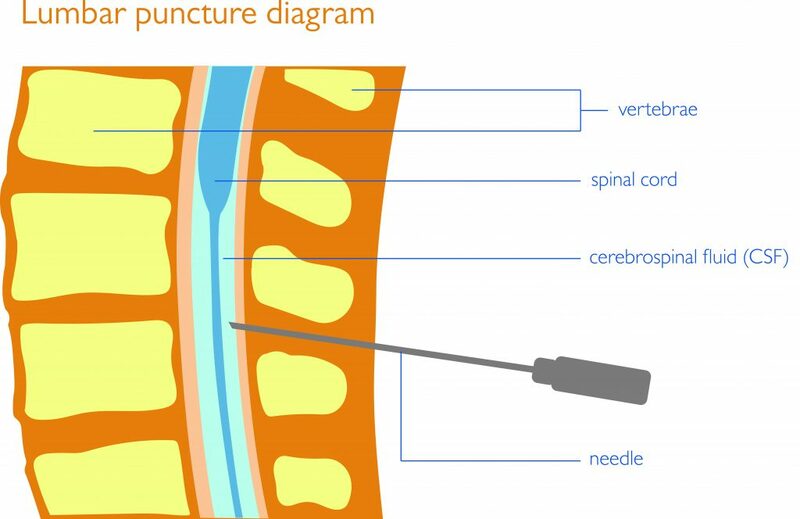 A lumbar puncture is used to confirm the diagnosis of meningitis and to check for signs of what is causing it. The test involves taking and analysing a sample of the fluid that surrounds the brain and spinal cord, a clear liquid called cerebrospinal fluid (CSF). To take a sample of this fluid, a needle is passed between two vertebrae (spinal bones) at the lower end of the spine into the space containing the CSF. A small amount is drawn off in a syringe and sent to a laboratory to be analysed. The test can identify the presence of bacteria or viruses in the CSF and can confirm the diagnosis of meningitis. The results of a lumbar puncture are used to inform what treatment is needed. A CT or MRI scan may be performed to check for signs of inflammation of the meninges, and to rule out other problems which could potentially be causing your symptoms such as stroke, subarachnoid haemorrhage, an abscess or a tumour. A CT scan (Computerised Tomography scan) is a special type of X-ray which takes pictures of the brain from different angles. An MRI scan (Magnetic Resonance Imaging scan) produces detailed pictures of the brain using strong magnetic fields and radio waves. Sometimes, during a CT or MRI scan, a dye (contrast agent) is injected into a vein in your arm. The dye travels though your bloodstream to your brain and can help to highlight in the pictures any areas where there is inflammation (swelling). Anti-fungal treatments will be given to treat fungal meningitis. If your symptoms are severe, you are likely to need treatment in an intensive care unit. You might receive help with breathing (oxygen through a face mask) and help with feeding and hydration (via a drip). If you are experiencing seizures as a symptom of meningitis, you will be given anti-epilepsy drugs (AEDs) to control seizures. You might receive other drugs such as steroids (to reduce inflammation), diuretics (to reduce pressure inside the head), and sedatives (to calm people if they are agitated and to help control seizures). If you are diagnosed with viral meningitis, you will usually find that symptoms improve within a few days and most recover fully after one to four weeks. It is common for you to experience tiredness for a longer period following this. If bacterial meningitis is treated early there is usually a gradual improvement in symptoms within the first two to three days. Although symptoms such as headache and fever may improve quickly with the appropriate form of treatment, meningitis can cause longer-term problems – particularly in cases with a more severe degree of infection and inflammation. These long term issues can include hearing problems (due to damage to the acoustic nerves), seizures or epilepsy, hydrocephalus (a build-up of CSF in and around the brain), memory problems, changes in personality and behaviour, speech problems, and weakness on one side of the body. If bacteria get into the bloodstream and cause septicaemia (blood poisoning), other body tissues can be damaged. If the damage is severe, you might experience gangrene where the tissue begins to die in an affected area. In very serious cases, fingers, toes or limbs might need to be amputated. If there is a build up of fluid around the brain and you develop hydrocephalus, then you might need a surgical treatment to implant a small tube to drain away the excess CSF from your brain, called a shunt. If you experience seizures you might need anti-epilepsy drugs (AEDs) to help control them. Depending on your individual situation, you might benefit from physiotherapy to help with mobility and physical problems or speech and language therapy to help with speech problems. A neuropsychologist or a clinical psychologist can help with memory problems and personality changes. Many people find that these services are an important part of longer-term recovery and rehabilitation. This information was last checked in January 2015. Due for review in January 2018.